The people known today as 'Picts' were essentially un-Romanised Britons who occupied much of the territory of modern-day Scotland north of the Forth and Clyde during the middle part of the first millennium AD. From place-name evidence they are believed to have spoken a P-Celtic (Brythonic) language, though no written texts in the Pictish language remain. 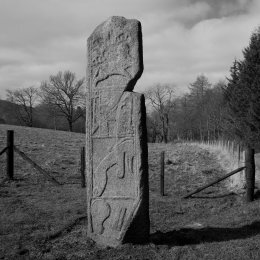 From the early 10th century onwards, the language of the Picts seems to have been subsumed by Gaelic and Norse; this process was complete by the early middle-ages and today very little of their legacy remains other than the enigmatic carved stones to be found throughout their former territory. - mundane objects, often in pairs, e.g. mirror & comb or tongs & shears - these often appear towards the foot of a stone. Their repeated use implies that such symbols formed part of a common visual language. The symbols are usually combined in pairs, with abstract forms the most common; as a rule, animal forms only appear along with abstract ones. The earliest stones, dating from the 6th, 7th and 8th centuries, are unworked and the symbols are 'incised' (i.e. carved into the rock). In the classification introduced by Allen & Anderson in 'The Early Christian Monuments of Scotland' (1903), these are often referred to as 'Class I' stones. 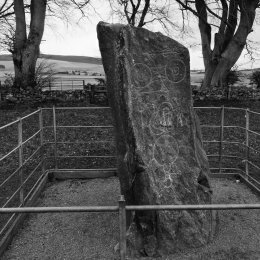 Following the Christianisation of the Picts during the 6th and 7th centuries, 'Class II' stones began to be produced. These are carved in relief (i.e. 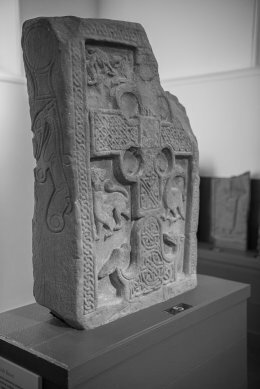 the surrounding rock is carved away to leave the symbols prominent) on roughly rectangular slabs; they feature crosses and Christian motifs as well as the standard Pictish symbols. Class II stones continued to be produced at least into the 10th century. 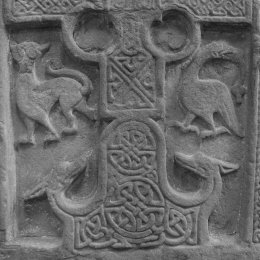 I have a long-standing interest in Pictish symbol stones and in early Scottish history in general. In February 2015 I started a project to document some of the stones photographically. Many are to be found in the area in which I live in north-east Scotland. 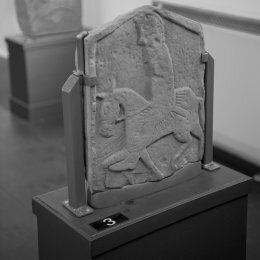 Further information on these stones may be found in the on-line catalogue of the Royal Commission on the Ancient & Historic Monuments of Scotland (RCAHMS). For each stone photographed, I have given the relevant URL.